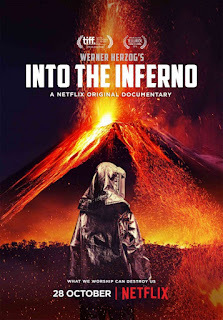 Filmmaker Werner Herzog neatly sums of the this of INTO THE INFERNO, his new film about volcanoes, thusly: "Obviously there was a scientific side to our journey, but what we were really chasing was the magical side, no matter how strange things might eventually get." And rest assured, they do get strange. With Herzog at the helm, we'd expect nothing less. But before INFERNO goes off on odd tangents, it has already impressed us with some truly awe inspiring shots of magma bubbling and churning and shooting high into the air, shot by cameras that get much closer to their subject than most would find comfortable. And of the awful destruction lava and volcanic ash can wreak when set loose from the earth. Capturing this footage is undoubtedly dangerous. But, as Herzog tells his partner in this endeavor, volcano researcher Clive Openheimer, he is not insane. To what degree it's possible, he and the camera crew take every precaution they can. As an unexpected eruption while filming in Indonesia shows, however, no amount of preparation and safety gear can fully guarantee safety when dealing with a powerful and unpredictable force of nature. What makes this a Herzog film and not a typical nature documentary is the subtext it explores about how volcanoes have shaped human culture. Everywhere Herzog and his crew film, the peoples living nearby have belief systems that have been shaped by volcanoes. Even in North Korea, we see how Kim Il-sung appropriated the volcanic Paektu Mountain into his personal mythology. Herzog perhaps spends a bit more time on North Korea than necessary, but it's hard to blame him. It's not as if westerners are routinely allowed to film there. Obviously, Herzog only gets to see what the government wants him to see, but he manages to emerge with something meaningful and true, nonetheless. If you want a straight up science documentary on volcanoes, no doubt Nova or National Geographic would have films and programs more to your liking. 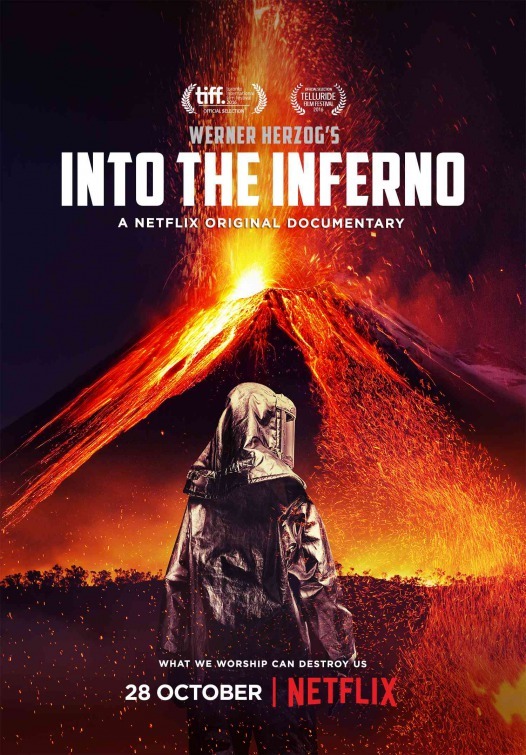 What makes INTO THE INFERNO special is the way it is infused with Herzog's personality and point of view. Because of that, it leaves us with a healthy respect for the power of nature, and a thoughtful understanding of how that power has affected humanity over the centuries, and continues to do so in the present. 3 ½ out of 4 stars.